"This morning, the ultimate dream of a planet watcher was come true: all of the planets condensed before me into one straightforward, nowhere peripheral view. It struck me like nine-branched lightning, held me still as a (deeply breathing) statue. All the planets at once." The five brightest planets - Mercury, Venus, Mars, Jupiter and Saturn - have been known since ancient times and can easily be seen with the naked eye if one knows when and where to look. They are visible for much of the year, except for short periods of time when they are too close to the Sun to observe. All of the planets will not normally be visible on a single night, however. 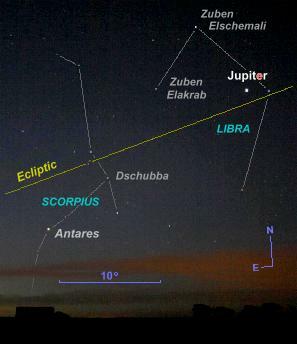 Jupiter, Libra and Scorpius At First Light Jupiter was in the constellation of Libra when this photo was taken at dawn in January 2006. Jupiter - the bright white 'star' visible towards the upper right - then shone at an apparent magnitude of -2.0, outshining all of the stars in its vicinity (move your cursor over the image - or click here - to identify Jupiter and the constellations, and click for a full-size picture). The planets can be distinguished from the stars because their position changes slightly against the background stars from one night to the next, and their brightness varies in a regular cycle over a period of time. Stars are so distant that they appear as points of light in the night sky, and they appear to twinkle (or scintillate) because of turbulence in the Earth's atmosphere. Even in the largest Earthbound telescopes, a star appears as little more than a point of light. The naked eye planets, on the other hand, are close enough to the Earth to form a sizeable (but nonetheless tiny) disk in the night sky and consequently, when they are well above the horizon, the planets shine with a more steady light than the stars. Of the brighter planets, only Saturn and Mars are ever likely to be mistaken for ordinary stars - but only during their dimmer, more distant periods. The stars generate their own light by internal nuclear fusion reactions, however the planets do not produce any light of their own; instead, they shine by reflecting a proportion of the sunlight they receive back out into space. The proportion of sunlight they reflect (known as the albedo) depends upon the planet's size, the amount of cloud cover it has and - where there is little or no cloud cover - the reflectivity of the features on its surface. The brightness of a planet to the naked eye depends upon a number of factors; its distance from the Sun, its apparent size (i.e. its angular size when seen from the Earth) and the relative positions of the planet and the Earth in their orbits. The period of time during which any given planet (or any other celestial body) can be seen is known as an apparition. For Mercury and Venus, this is the period during which the planet is well seen in either the morning sky or the evening sky. For Mars and beyond, an apparition is measured from the time the planet becomes visible in the dawn sky (rising shortly before the Sun) to the time it disappears into the dusk sky (setting shortly after the Sun). The length of a planet's apparition depends upon its orbital period (i.e. the time it takes the planet to orbit the Sun) and its position in relation to the Sun and the Earth at any given time. Apparitions can last from just a few weeks (in the case of Mercury) to almost two years (for Mars) although a planet is normally seen at its best for only a part of this time. Unlike galaxies and nebulae which are invariably faint, the naked-eye planets can easily be seen in light-polluted skies (i.e. where the night sky glows yellow-orange due to a multitude of poorly-directed lighting from streetlights and other illuminations). The planets each have their own movement, brightness and colour characteristics. The ancient Greeks, around the sixth century BC, referred to them as 'planetes asteres' ('wandering stars') from which the word 'planet' is derived. They named each planet mainly according to its brightness and colour, the name given to them being mostly associated with heat and light. Hence Venus' brilliant white colouration earned it the name Phosphoros ("the light-bearing one") and Mars' orange-red colour was associated with fire, so it was given the name Pyroeis ("the fiery one") and so on. In the fourth century BC, the Greek philosopher Aristotle converted these descriptive names into the names of Greek gods (and one goddess), each planet's attributes roughly matching those of its chosen god. The Romans later acquired these Greek names and translated them into their own equivalent gods, and these are the names that we still use today; hence the Greek goddess Aphrodite became the Roman goddess Venus and the Greek god Ares became the Roman god Mars, etc. Saturn in Leo, 2007 Between 2006 and 2009, golden-yellow Saturn appeared as an additional bright 'star' in the constellation of Leo, the Lion (move your cursor over the image - or click here - to identify the stars, and click for a full-size picture). When another three planets were discovered in more recent times - namely Uranus, Neptune and Pluto, they were also given the names of Graeco-Roman gods, continuing the earlier tradition. Uranus is the only one of the major planets which retains the name of a Greek god (Ouranos) - this is because the Romans had no god which was equivalent to Uranus. The names of the ancient Roman and Greek gods (and one goddess) which were associated with the planets are given in the Planet Appearance section below, together with a picture of each one (in the form of a statue, a statuette or a bust). At a meeting of the International Astronomical Union (IAU) in Prague, Czech Republic in August 2006, astronomers decided that Pluto will no longer be officially classed as a 'planet' in the true sense; instead, it is now part of a new class of Solar System bodies known as dwarf planets, together with Ceres (the largest of the asteroids) and Eris (previously known as 2003 UB313 or 'Xena'). In 2008, Makemake (pronounced 'MAH-keh MAH-keh') and Haumea joined the growing list of dwarf planets. Consequently, there are now officially only eight true planets in our Solar System. We are subtly reminded of the naked eye planets, together with the Sun and the Moon, in our names of the days of the week. Saturday, Sunday and Monday are evidently named after Saturn, the Sun and the Moon respectively; they are Old English adaptations of the Roman names Saturnus, Sol and Luna. The remaining weekdays were named after the Anglo-Saxon and Norse equivalents of the Roman gods Mars, Mercurius, Jupiter and Venus - they are namely 'Tiw's Day' (after the Old English version of T�r, the Norse God of War), 'Woden's Day' (after the Anglo-Saxon version of Odin, the Norse God of War and Wisdom), 'Thor's Day' (after the Norse God of Thunder) and 'Friga's Day' (after Freyja, the Norse Goddess of Love and Beauty). In the French language, the Moon and planets are also clearly evident in the days of the week: Lundi (Moon's day), Mardi (Mars' day), Mercredi (Mercury's day), Jeudi (Jupiter's day), Vendredi (Venus' day) and Samedi (Saturn's day). The month of March is also named after Mars. Detailed star charts showing the paths of the superior planets (i.e. from Mars to Pluto) and for the evening apparitions of Venus are given under each planet entry in the main section below (the path of Mercury is often included in the Venus evening charts). Planet Chart (by Dan Bruton). Includes Uranus, Neptune and Pluto. Also shows the planets' present astronomical co-ordinates of Right Ascension (longitude, measured in Hrs, Mins) and Declination (latitude, measured in degrees North [+] or South [-] of the celestial equator). The Solar System - What's Observable? (by Graham Relf / BAA Computing Section). The graphic shows the whole of the celestial equator and a band 45� to North and South of it. The graphic is plotted in such a way that the Sun is always at both ends. The vertical green line at the centre represents the observer's meridian at midnight. Comets, minor planets (asteroids) and the Messier objects can also be added to the display. A detailed description is provided with the graphic. Star map showing the path of the Ecliptic through the Constellations The ecliptic (yellow curve) is the apparent path of the Sun through the constellations, as seen from the orbiting Earth. Its path forms the basis of the twelve well-known zodiac constellations (Pisces, Aries, Taurus, etc). The naked-eye planets and the Moon follow the ecliptic very closely, hence they will always be found on or near the yellow curve in this diagram. Move your cursor over the diagram (or click here) to reveal the constellation names in their abbreviated three-letter form - the full names are listed here). Zodiac constellations are labelled in green and non-zodiac constellations in grey. 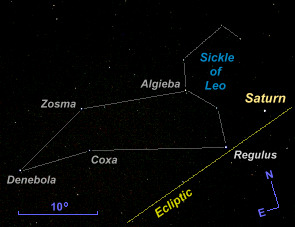 A Southern hemisphere view of the labelled constellations can be seen here. The significant solar positions marked on the chart apply to the Northern hemisphere and are as follows: VE = Vernal (Spring) Equinox, SS = Summer Solstice, AE = Autumnal Equinox and WS = Winter Solstice. The numbers along the sides of the chart (Right Ascension and Declination) are co-ordinates of celestial longitude and latitude which astronomers use to locate the position of a celestial body in the night sky (the overlay grid marks intervals of 10� in celestial longitude and latitude). Printer-friendly versions of the above chart are available for the constellation patterns only, the labelled constellations and the Southern hemisphere view. The graphic was based on a Flash program originally produced by David Colarusso. To see the current positions of the planets in their orbits (i.e. the view from above the Solar System), see Fourmilab Switzerland's 'Solar System Live' pages for the inner planets or the entire Solar System. A digital orrery (model of the Solar System) by Dr Thomas Morris appears on the BAA website. The orrery can be animated and/or adjusted by date. The mathematical equations required to find the planets' positions are described in this article by David Colarusso. 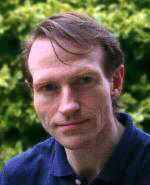 For those wishing to programme a computer with the formulae (using Pascal, BASIC, Fortran, C++, etc) Paul Schlyter provides a tutorial here and a detailed discussion here (includes the planets' orbital elements and the necessary formulae in an appropriate format for computer programming languages). When are the Planets currently on view? The following table provides an indication of the times of the day in which to view each of the planets in 2019 (Pluto is not included because it is solely a telescopic object). The table entries can be read horizontally by planet (to track the changing visibility of a particular planet during the year) or vertically by month (to determine the visibility status of all the planets in any single month). 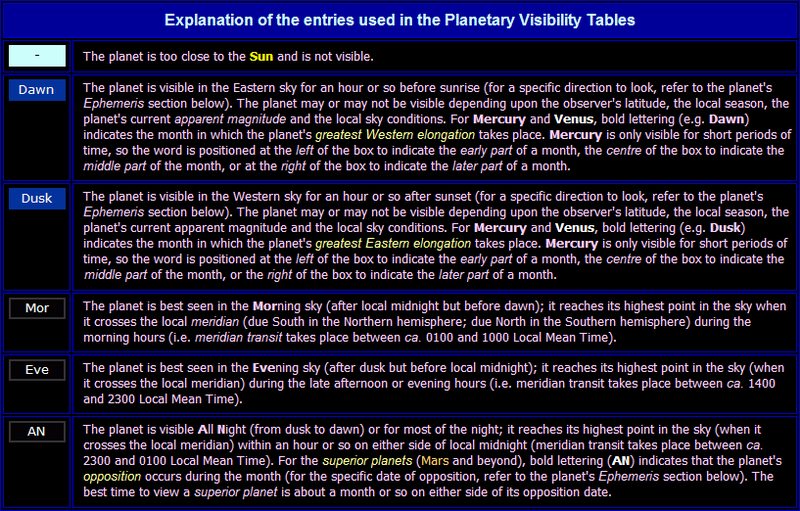 Visibility tables for the years 2008 to 2025 can be seen on the Visibility of the Planets page. 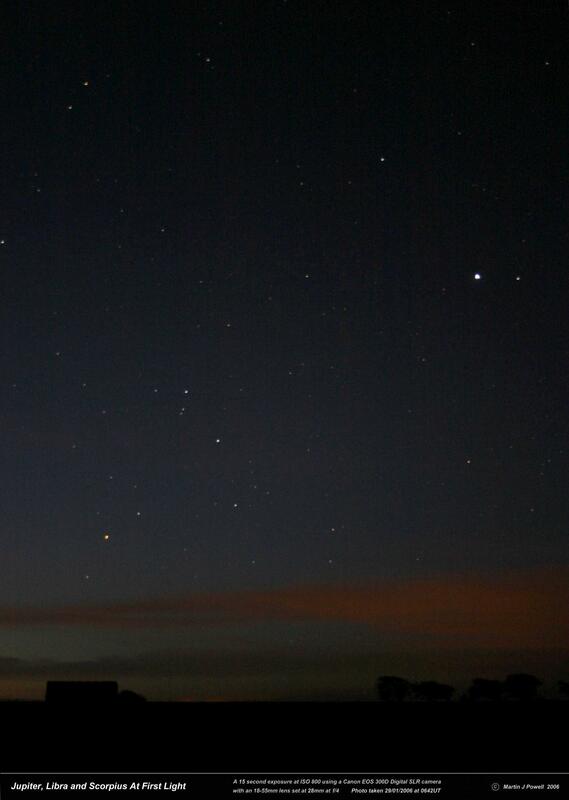 When two or more planets are listed as being visible at 'Dawn' or 'Dusk' in any particular month (e.g. if Mercury, Venus and Mars all appear listed under 'Dusk' in a single month) they are likely to appear close together in the sky during this time, and planetary conjunctions (when two planets are at the same celestial longitude) are most likely to take place. Tables of planetary conjunctions (through to 2020) can be found on the following pages: Venus, Mars, Jupiter, Saturn, Uranus and Neptune. 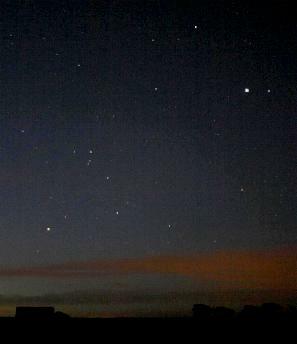 Because they mostly occur around dawn or dusk, conjunctions can often be difficult to observe, depending upon the observer's latitude and the local season. For this reason, the tables include an assessment of the likely visibility of each conjunction from both Northern and Southern hemispheres. General visibility times of the planets in 2019 Visibility times of the planets are shown here in general terms for the current year; for an explanation of each entry, see the box below. With the exception of Mercury, the times are based on the planets' positions at mid-month. Note that, although a planet may be listed as being visible at a particular time in a month, this does not necessarily mean that it will be visible from all locations on Earth. The observer's latitude and the local season can affect whether a planet is seen or not; this is particularly so for the 'Dawn' and 'Dusk' entries and especially so in the case of Mercury (see under Mercury's description for more details). Since the planets' viewing times can change in the course of a month (eg. from Dawn to Morning sky visibility) the entries inevitably contain an element of imprecision; consequently the table should only be used as a general guide to assess the times at which to view the planets. Click on a planet name to be taken directly to the planet's description and ephemeris. This Java Applet shows the current phase of the Moon, the percentage of the lunar disk illuminated, the Age of the Moon (ie. the number of days elapsed since the moment of the last New Moon), its current distance from the Earth (1km = 0.6214 statute miles) and the dates of the next New Moon, First Quarter, Full Moon and Last Quarter phases. Also shown are the dates when the Moon next reaches perigee (its closest point to the Earth) and apogee (its furthest point from the Earth). The diagram shows the Moon orientated with North up and East towards the left (i.e. 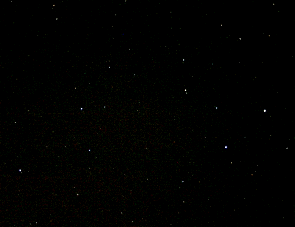 the Northern hemisphere view); Southern hemisphere observers will need to invert the image to obtain a correct view. The following images of the planets were taken by the writer using a video camera or a digital camera, and they give some indication of their naked eye appearance (or in some cases, their appearance with optical aid). The planets are listed in approximate descending order of their average apparent magnitude (brightness) when seen from the Earth. The brightness values listed for Mercury, Venus, Mars and Jupiter are the brightest and dimmest magnitudes the planet can attain throughout its orbit (the brightest magnitude is listed first); those for Saturn, Uranus, Neptune and Pluto are the average brightness values for when the planet is closest to the Earth. It is worth pointing out that planetary magnitudes will often vary between sources (by up to �0.2 magnitudes) depending upon the parameters used to calculate planetary brightnesses and/or whether the magnitudes have been rounded to a single decimal place. Following each description is a simplified table of planet positions (known as an ephemeris) along with the dates of the planets' significant orbital configurations (oppositions, elongations and conjunctions) for the period from 2019 through to 2025 (inclusive). Planetary positions and configuration dates can be viewed back to 2005. An explanation of the abbreviations used in the tables can be seen here. For the superior planets (i.e. from Mars to Pluto) star maps are included showing the positions of the planets to help in locating them in the night sky (maps are provided for both Northern and Southern hemisphere views). Click on a starmap thumbnail to see the full-size image and an accompanying description (these will open in a new window). With the exception of the Uranus and Neptune finder charts, all star maps are drawn at the same scale, indicated by a 10� scale bar. Note that the star maps include an element of distortion because of the cartographic projection; this is particularly the case where they cover large areas of the sky. A brief discovery and/or observational history concludes each planet's entry. For a full explanation of planetary movements and their visibility cycles, and the various terms used to describe them, see the accompanying article 'Wandering Stars'. Venus is by far the easiest planet to see with the naked eye. It shines with a brilliant white light, although some claim that it has a slightly bluish tint. It is the brightest planet in the night sky; when visible, it outshines all the other planets - and indeed all the other stars in the night sky - at which time only the Sun and the Moon are brighter. 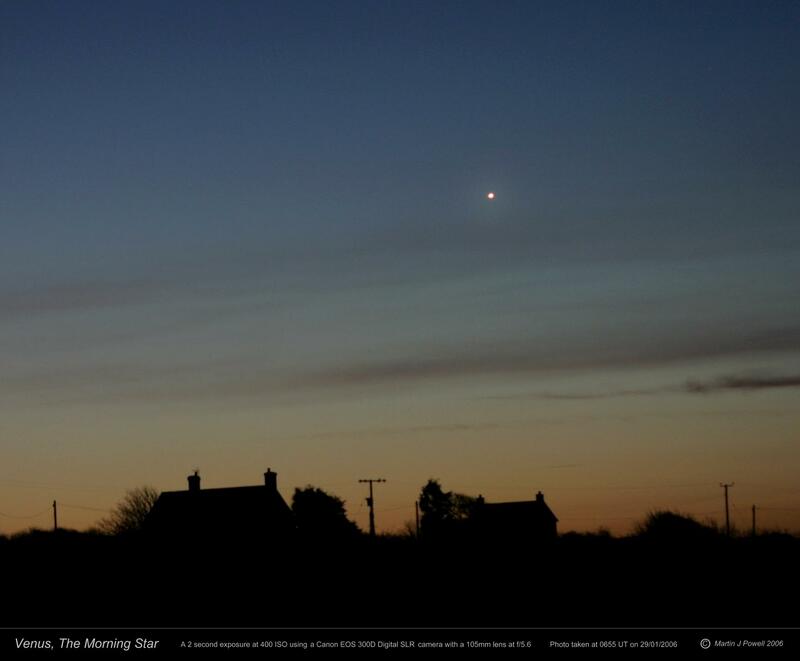 Venus has a cycle of alternating morning and evening appearances, and is popularly named The Morning Star (when seen in the Eastern sky before sunrise - see photo) and The Evening Star (when seen in the Western sky after sunset). Each apparition lasts for several months, during which time the planet slowly moves away from the Sun, reaches its greatest elongation (around 46 degrees away) and then slowly moves back towards the Sun, eventually disappearing into the morning or evening twilight (remaining visible for most of the time). At greatest elongation, Venus rises/sets some 3 hours before/after the Sun. When seen through a telescope, Venus shows phases much like the Moon (to understand why the phases of Venus appear as they do when seen from Earth orbit, refer to the 'Inferior Planets' section of the Planet Movements page). Venus' thin crescent phase can be discerned in good quality binoculars when it is in the nearer part of its orbit to the Earth (i.e. when it is closing in on the Sun in the evening sky, or pulling away from the Sun in the morning sky). Some keen-eyed observers have even claimed to see the crescent with the naked eye! However, Venus' brilliance produces considerable glare when seen against a dark sky, so when using optical aid, it is best observed in bright twilight. When shining at its greatest brilliancy, Venus can cast faint shadows at night, and it can even be glimpsed in daylight (given a clear, haze-free sky and provided that the planet is well clear of the Sun). The best way to see Venus in daylight is when it is a 'Morning Star', when it can be continually observed through to sunrise and beyond. Venus comes closer to the Earth than any other planet - to within 26 million miles (41 million kms). Its brilliance is largely due to the high reflectivity (albedo) of its clouds, which perpetually obscure the view of the planet's extremely hot surface. Venus is visible for about 8 months before its greatest Eastern elongation date (evening apparition) and for a further 2� months afterwards, after which it disappears into the evening twilight. For morning apparitions, it is visible for about 2� months before its greatest Western elongation and for a further 8 months afterwards, following which it disappears into the morning twilight. Its greatest brilliance occurs about 5 weeks after greatest Eastern elongation (evening apparition) and about 5 weeks before greatest Western elongation (morning apparition). In the following list, greatest elongation details are given in brackets in the format "Solar elongation, Constellation". Hence "46�, Ari" means "46� from the Sun, in the constellation Aries". Its elongation from the Sun at dates other than greatest elongation can be estimated on the basis that the angular elongation is 0� at inferior and superior conjunction (Venus typically remains close to its greatest elongation for about a week or two before and after the greatest elongation date). 2019 GE(W) Mor: Jan 6 (47�, Lib), SupCon: Aug 14. 2020 GE(E) Eve: Mar 24 (46�, Ari), InfCon: Jun 3, GE(W) Mor: Aug 13 (46�, Ori). 2021 SupCon: Mar 26, GE(E) Eve: Oct 29 (47�, Oph). 2022 InfCon: Jan 9, GE(W) Mor: Mar 20 (46�, Cap), SupCon: Oct 22. 2023 GE(E) Eve: Jun 4 (45�, Cnc), InfCon: Aug 13, GE(W) Mor: Oct 23 (46�, Leo). 2024 SupCon: Jun 4. 2025 GE(E) Eve: Jan 10 (47�, Aqr), InfCon: Mar 23, GE(W) Mor: Jun 1 (46�, Psc). 'Mini star map' showing the path of Venus through the zodiac constellations during its morning apparition from November 2018 to August 2019 (click to see full-size image, description of the apparition and Moon nearby dates for the period). The phases of Venus were first observed telescopically by Italian astronomer, philosopher and physicist Galileo Galilei in 1610, using one of the world's first telescopes (the first telescope is believed to have been made by Dutch spectacle maker Hans Lipperhey around 1609-10). The observation of Venus' Moon-like phases was an important discovery because it provided clear evidence in favour of the 'Copernican' system of planetary orbits - proposed by Polish cleric and astronomer Nicolaus Copernicus in the 16th century - which said that the Sun was at the centre of our Solar System. In Galileo's time, the 'Ptolemaic' system - which put the Earth at the centre of the Solar System - was the widely held view. Galileo's defence of the Copernican system brought him into conflict with the Roman Catholic Church, and it ultimately led to him being held under house arrest until his death in 1642. Jupiter appears bright white and is a very obvious sight in the night sky. Like Venus, it can be seen in twilight, and it always shines brighter than the brightest star in the night sky - Sirius (magnitude -1.4). 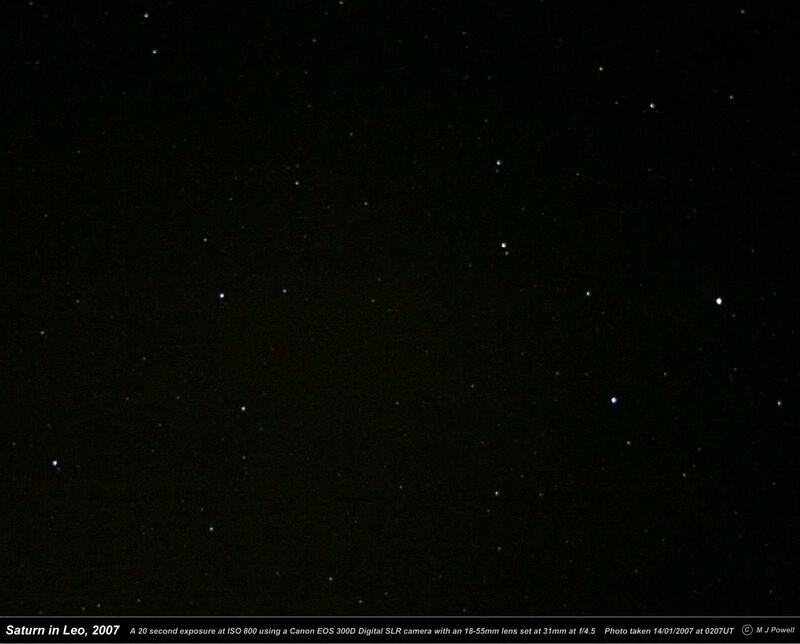 Viewed from the Earth, Jupiter is seen to move through about one zodiac constellation (ca. 30 degrees) each year. Steadily-held, good quality binoculars or a small telescope will show Jupiter as a small white disk; its four brightest natural satellites (moons) - Ganymede (magnitude +4.6 at opposition), Io (+5.0), Europa (+5.3) and Callisto (+5.6) - can also be seen close by, changing their positions from one night to the next. The four moons are brighter than the typical naked eye limiting magnitude (ca. +6.0) and they would be visible to the unaided eye were it not for the fact that their close proximity to Jupiter causes them to be washed out by the glare of Jupiter itself. Sometimes only two or three moons will be seen on a given night - in which case, the remainder are either in front of, or behind, the giant planet. Small telescopes will show Jupiter as a pale white or cream-colour. They will also reveal the planet's two most prominent cloud belts: the North and South Equatorial Belts, and with patience, Jupiter's most famous feature - its Great Red Spot. Although it is by far the largest of the Solar System planets, Jupiter is not the brightest planet when seen from the Earth - this particular honour goes to Venus. Jupiter is fainter than Venus because of its much greater distance from the Earth. Like Venus, Jupiter can also cast faint shadows at night when it is shining at its brightest and is observed under very dark skies. 2019 Opp: Jun 10 (Oph), SupCon: Dec 27. 2020 Opp: Jul 14 (Sgr). 2021 SupCon: Jan 29, Opp: Aug 19 (Cap). 2022 SupCon: Mar 5, Opp: Sep 26 (Psc). 2023 SupCon: Apr 11, Opp: Nov 3 (Ari). 2024 SupCon: May 18, Opp: Dec 7 (Tau). 2025 SupCon: Jun 24. Jupiter's four brightest moons were first seen telescopically by Galileo in 1610; for this reason they are often referred to as the 'Galilean satellites' or simply the 'Galileans'. A year later, the moons were observed independently by German astronomer Simon Marius, who subsequently named them. Jupiter's Great Red Spot was probably first observed by English scientist Robert Hooke in 1664, followed a year later by Italian astronomer Giovanni Cassini. Mars is easily recognised since it has the most distinctive coloration of all the naked eye planets. Although it is popularly called 'The Red Planet', it rarely appears red to the naked eye; in fact, it varies from pale orange-yellow to orange-red, depending upon its distance from the Earth and therefore, its brightness. The reddish colour is caused by the presence of iron oxide (rust) on the planet's surface. Mars' attractive coloration has often given rise to descriptive terms such as "orange spark", "campfire orange", "pumpkin orange" and so on. Occasional global dust storms on Mars, such as those which happened in 2001 and 2007, can however make it appear decidedly yellowish. Because of its eccentric orbit, Mars' distance from the Earth varies considerably from one opposition to the next, which typically take place about every 2 years and 7 weeks (see Mars oppositions page). Mars' brightest (and best) oppositions occur in groups of two or three which repeat in a cycle of about 16 years, when its orbit brings it closest to the Earth (35 million miles/56 million kms distant). In the opposition of 2003, Mars came closer to the Earth than it had been for almost 60,000 years. For about six weeks either side of opposition, Mars can clearly be seen in twilight; at its brightest, Mars outshines Sirius (the brightest star in the night sky) but even at its more distant oppositions it outshines the star Arcturus (magnitude -0.0). Note that because of Mars' eccentric orbit, the dates of its opposition and its closest approach to the Earth can differ by up to two weeks. When it is on the far side of its orbit from the Earth (i.e. in between oppositions) Mars appears as an unremarkable, orange-red 'star', shining only about as bright as the stars of Orion's Belt for much of the time. Through a telescope, Mars typically appears amber or salmon-pink in color. It is a difficult planet to observe - despite its relative closeness - since it is only about half the size of the Earth. Under good atmospheric seeing conditions, small telescopes will reveal one or other of its polar caps and some bluish-grey surface markings which often change their appearance with the Martian seasons. Mars has two asteroid-like moons, Phobos and Deimos. They are too faint to be seen with binoculars and can only be seen with medium and large-sized telescopes around opposition - and even then, only when their orbits carry them well clear of the planet's bright disk. A device known as an occulting bar can be used to conceal Mars from view in the telescopic eyepiece, allowing the moons to be spotted with greater ease. 2019 SupCon: Sep 2. 2020 Opp: Oct 13 (Psc). 2021 SupCon: Oct 8. 2022 Opp: Dec 8 (Tau). 2023 SupCon: Nov 18. 2024 -. 2025 Opp: Jan 16 (Gem). Star map showing the path of Mars through Ophiuchus, Sagittarius, Capricornus and Aquarius from February to December 2018 (click for full-size image, a detailed description of the 2017-19 apparition and Moon nearby dates for the current apparition). The first telescopic observation of Mars was by Galileo in 1610. He was able to resolve the gibbous phase of the planet, but no surface details. The first definite surface details were observed by Dutch astronomer Christiaan Huygens in 1659; his drawings show a dark triangular feature, which is now known to be 'Syrtis Major'. Mars' polar caps were first observed by Giovanni Cassini in 1666. When Italian astronomer Giovanni Schiaparelli turned his telescope on Mars in 1877, he saw what he believed to be a series of linear features criss-crossing the planet, which he named 'canali' (Italian for 'channels', though it was incorrectly translated into English as 'canals'). He thought they might be artificial structures, built by the Martians to irrigate the planet (by transferring water from the polar caps to the warmer, drier regions of the planet). His observations were supported by other astronomers, the most notable being Percival Lowell (founder of Flagstaff Observatory in Arizona) but the idea was rejected by numerous others, who were unable to see the features that Schiaparelli had claimed to see. The 'canals on Mars' controversy was finally resolved when the first spacecraft were sent to take close-up pictures of the planet in the 1960s. No canals were found to exist on Mars, and what Schiaparelli had probably seen were the result of telescopic defects or tricks of the eye. Schiaparelli had also believed that the dark regions on Mars were caused by vegetation growth (an idea first suggested by French astronomer E. Liais in 1860). The idea seemed credible because the dark areas appeared to expand and retract in synchrony with the Martian seasons. Today we know that these dark regions are simply a colour contrast effect; their apparent spreading and shrinking being the result of seasonal dust storms, which blow light-coloured dust away from the darker-coloured surface. In 1898, partly inspired by Schiaparelli and Lowell's ideas, English writer H. G. Wells published his classic novel 'The War of the Worlds', which described a Martian invasion of the Earth as witnessed by a London-based writer (see Reference 1). The moons Phobos and Deimos were discovered by American astronomer Asaph Hall at the U.S. Naval Observatory in Washington, DC in 1877. Remarkably, two Martian moons had been suggested by author Jonathan Swift in his fictional novel 'Gulliver's Travels, Part III: A Voyage to Laputa', published in 1727 - some 150 years before their discovery! Voltaire's short story 'Microm�gas', published in 1750, also referred to Mars having two moons (see Reference 2 for online links). The logic behind their idea seems to have been that, since the Earth had one moon and Jupiter was known to have four moons, Mars must have had an intermediate number, i.e. two moons! However, an alternative explanation may be that the authors drew their inspiration from German astronomer Johannes Kepler, who in 1610 had apparently suggested that Mars may have two moons. All three 'visionaries' were officially recognised following spacecraft missions to the Martian moons in the 1970s - Kepler had a geological ridge on Phobos named after him, whilst Swift and Voltaire each had a crater on Deimos named after them! Mercury is generally more difficult to spot than the other bright planets, mainly because, from the vantage point of the Earth, Mercury never appears very far from the Sun (between 17 and 28 degrees away, the variation being due to its highly eccentric orbit). Consequently it can only be seen with the naked eye when it is low down in twilight (shortly after sunset or before sunrise) and it is never seen in fully dark skies. Mercury typically makes three morning appearances and three evening appearances each year, though for any given location on Earth, Mercury will only be well placed for viewing on about half of these occasions because of the length of local twilight and the angle of the ecliptic to the local horizon. For Northern Hemisphere observers, Mercury is best seen on March-April evenings and September-October mornings; Southern Hemisphere observers get their best views on September-October evenings and March-April mornings. Around greatest elongation in the evening, binoculars will help to locate it - in the general direction of the sunset - around 45 minutes or so after sundown (the exact time to start looking depends upon the length of local twilight) after which its position should be easily pinpointed with the naked eye. Likewise, during morning apparitions, the planet should be found in the general direction of sunrise about 45 minutes or so before sunup. Mercury is generally white in colour, though its low altitude (angular height above the horizon) causes it to take on a somewhat pinkish hue, for the same reason that the Sun appears reddish at sunrise or sunset (indeed, both Venus and Jupiter can appear orange-red when they are close to the horizon). Because Mercury is the closest planet to the Sun and it moves so swiftly, its brightness varies rapidly during any given apparition. Like Venus, Mercury shows phases when seen through a telescope, however Mercury is a less impressive sight because of its smaller apparent size and the much poorer seeing conditions at low altitude. For the same reason, Mercury appears to scintillate (twinkle) more readily than the other bright planets. Mercury is easiest to see when it reaches greatest elongation, however it can normally be seen for several days either side of this date. A flat, unobstructed horizon is required to see it. In the following list, details are given in the format "Solar elongation, Constellation, Favourable Viewing Hemisphere". Hence "19�, Vir, NHem" means "19� from the Sun, in the constellation Virgo, best seen from the Northern Hemisphere". The constellation in which Mercury is located is rarely visible because of twilight, however it can be used as an aid in determining the direction in which to look for the planet (times of local sunrise, sunset and twilight can be obtained from TimeandDate.com). Mercury can sometimes be found more easily when Venus is nearby; for a list of dates when this occurs (through to 2020) see here. * A Transit of Mercury across the Sun takes place on November 11th 2019. "This star tormented me with its many twistings and toilings, in trying to explore its motions." The phases of Mercury were first observed telescopically by another Polish observer - Johannes Hewelcke (commonly known as Hevelius) - in the first half of the 17th century. The first serious observation of the planet was by English (but German-born) astronomer and musician Wilhelm (William) Herschel in the late 18th century. Herschel was, however, unable to detect any of Mercury's surface features. Saturn appears pale yellow to the naked eye. Although never appearing as bright as the other naked eye planets, it is nonetheless obvious when its position is known. At its brightest, Saturn outshines all of the stars except Sirius (magnitude -1.4) and Canopus (magnitude -0.7). Saturn's famous ring system can be seen in a small telescope at magnifications above ca. 20x; high magnification binoculars will just reveal its elliptical shape when the rings are open to view. The rings contribute a great deal to its brightness, and in fact, from the vantage point of the Earth, they are not always on view. About every 15 years, the rings are edgewise-on to the Earth's line-of-sight, at which times they are only seen as a thin line in telescopes - or not at all - and as a result the planet appears much dimmer in the sky. When its rings are fully displayed - at opposite points in its orbit - Saturn shines at its brightest; this last took place in 2017. For more details, see the diagram of Saturn's orbit, which includes an animation of its changing ring aspects from 1993 to 2020. When around opposition (and preferably when free of moonlight) binoculars will often reveal Saturn's largest moon Titan (magnitude +8.3 at opposition) as a faint star-like point of light close to the planet. It orbits Saturn once every 16 days, appearing up to four Saturn ring-diameters away from the planet's centre. Small telescopes will show Titan easily, along with several more of Saturn's moons, most notably Rhea (+9.7), Tethys (+10.2), Dione (+10.4) and Enceladus (+11.7). The magnitude of Iapetus (+10.2 to +11.9) varies because its hemispheres differ greatly in brightness, the moon presenting opposing sides to the Earth when furthest east or west of the planet; it is always brighter when at western elongation than at eastern elongation. Of the brighter telescopic moons, Iapetus is the outermost, appearing up to thirteen ring-diameters away from the planet's centre. 2019 SupCon: Jan 2, Opp: Jul 9 (Sgr). 2020 SupCon: Jan 13, Opp: Jul 20 (Sgr). 2021 SupCon: Jan 24, Opp: Aug 2 (Cap). 2022 SupCon: Feb 4, Opp: Aug 14 (Cap). 2023 SupCon: Feb 16, Opp: Aug 27 (Aqr). 2024 SupCon: Feb 28, Opp: Sep 8 (Aqr). 2025 SupCon: Mar 12, Opp: Sep 21 (Psc). The first telescopic observation of Saturn was by Galileo in 1610, but his telescope was unable to resolve the rings in their true form. Saturn must have been a puzzling sight to Galileo; he saw the planet as three separate parts which, in his own words,"almost touch one another and never move nor change with respect to one another". Christiaan Huygens, following his telescopic observations of the planet in 1655, correctly described the true nature of the rings when he said "Saturn is surrounded by a thin flat ring not touching it anywhere, which is oblique to the ecliptic". Huygens also discovered Titan that same year. The early astronomers often referred to Saturn's rings as 'ansae' (Latin for 'handles') because of their apparent resemblance to the handles of a vase. Uranus is just visible to the naked eye when at its brightest, but only when seen from dark, non-light polluted skies; observers in city or town locations will probably have difficulty seeing it without optical aid. It is the most distant planet visible to the naked eye. Uranus appears star-like through binoculars, and as a small blue-green disk in telescopes. A star map is normally required to find it. 2019 SupCon: Apr 23, Opp: Oct 28 (Ari). 2020 SupCon: Apr 26, Opp: Oct 31 (Ari). 2021 SupCon: Apr 30, Opp: Nov 5 (Ari). 2022 SupCon: May 5, Opp: Nov 9 (Ari). 2023 SupCon: May 9, Opp: Nov 13 (Ari). 2024 SupCon: May 13, Opp: Nov 17 (Tau). 2025 SupCon: May 18, Opp: Nov 21 (Tau). "On Tuesday 13th of March, between ten and eleven in the evening, while I was examining the small stars in the neighbourhood of H Geminorum [Webmaster's note: this star is now called 1 Geminorum], I perceived one that appeared visibly larger than the rest; being struck with its uncommon magnitude, I compared it to H Geminorum and the small star in the quartile between Auriga and Gemini, and finding it to be much larger than either of them, suspected it to be a comet." The Finnish astronomer Anders Lexell proposed that what Herschel had found was in fact a planet, and he suggested it be called 'George III's Neptune' or 'Great Britain's Neptune' (Herschel discovered the planet whilst observing from his home town of Bath in England). Herschel himself proposed the name 'Georgium Sidus' ('The Georgian Star' or 'The Georgian Planet', in honour of George III, then King of England). Other suggested names included 'Hypercronius' and 'Transaturnis' (by Swiss mathematician Daniel Bernoulli), 'Herschel' (by French astronomer Joseph Lalande) and 'Austr�a' (by German scientist Georg Christoph Lichtenberg). None of these names followed the traditional naming scheme, however, and it was the German astronomer Johann Bode who suggested that 'Uranus' would be a more appropriate name for the planet. Although Bode suggested this name soon after its discovery, it took several decades to become accepted worldwide. In fact, the English astronomer John Flamsteed had already observed Uranus - but not identified it as a planet - some 90 years before its discovery, but he had assumed it was an ordinary star. There were no less than 16 other observations of this 'star', by three other independent astronomers, before its true nature was correctly identified. In 2013 Belgian amateur astronomer Ren� Bourtembourg suggested that Uranus had first been glimpsed (but noted as a star) around 128 BC by Hipparchus of Nicaea (ca. 190-120 BC). The observation was noted in the 'Almagest', a 2nd-century AD star catalogue usually credited to Claudius Ptolemy but considered by some to have been the work of Hipparchus. The planet was magnitude +5.4 and positioned in Virgo at the time, a few degrees North of its brightest star Spica. Asteroids - often called minor planets - are small rocky bodies which mostly occupy the region of the Solar System lying between Mars and Jupiter. By 2009, over 420,000 asteroids had been discovered, of various shapes and sizes, though only 14,000 of them have been officially named. Asteroids typically have highly-elliptical orbits and their orbital inclinations often carry them well outside the narrow band of the ecliptic occupied by the major planets. Of the four brightest asteroids - namely Vesta, Ceres, Pallas and Iris - only Vesta becomes bright enough to be glimpsed with the unaided eye from dark sites (reaching magnitude +5.2) although it does so only occasionally (e.g. in 2011, 2014 and 2018). All four of these asteroids - and a handful of others including Juno, Hebe and Eunomia - can be seen through binoculars, appearing as starlike points of light which move a short distance against the background stars from one night to the next. The standard procedure for identifying an asteroid through binoculars - once its general location has been found from a detailed astronomical ephemeris - is to sketch the stars seen in the binocular field of view, then return a night or two later to the same region of sky and note which of the 'stars' has moved - this will be the asteroid in question. Following an IAU meeting in the Czech Republic in 2006, the largest asteroid Ceres (pronounced 'SEER-ees') is now officially classed as a dwarf planet - one of a new, distinct category of Solar System bodies. The remaining asteroids are now technically referred to as small Solar System bodies (a category which also includes comets and all the moons of the Solar System). Asteroid orbits are continually subject to gravitational effects (known as perturbations) from the major planets and from neighbouring asteroids. Consequently, ephemerides for minor planets are not normally calculated a long time in advance because this could result in significant positional errors. Finder charts of the brighter asteroids visible in the current year, together with their opposition dates and magnitudes, can be obtained at the BAA's Computing Section website. The asteroids were discovered as a result of a curious numerical 'law' of planetary distances, first proposed by Johann Titius of Wittenberg in 1772, but which has no obvious relationship with the scientific laws of planetary motion. The 'law' was popularised later that year by Johann Bode, and it became known as Bode's Law (or rather more fairly, Titius-Bode's Law). The law suggested that a major planet should exist in the rather large 'gap' between the orbits of Mars and Jupiter. As a result, an extensive telescopic search was begun in 1800 by a group of six European astronomers calling themselves the 'Celestial Police'. The team did not discover a major planet, however, but a series of minor planets instead. Ceres was the first to be discovered (in 1801, by Sicilian clergyman and astronomer Guiseppe Piazzi) followed by Pallas (in 1802, by German Heinrich Olbers), Juno (in 1804 by Karl Ludwig Harding, also German) and Vesta (in 1807, also by Olbers). Iris - the fourth brightest asteroid - was the seventh to be discovered (by Englishman John Russell Hind in 1847). All of these asteroids were named after ancient Greek and Roman goddesses. The term 'asteroid' was coined in 1802 by Sir William Herschel (discoverer of Uranus); it is Greek for 'star-like', indicating their star-like appearance when seen through telescopes. The term did not attain widespread usage until the 1850s, however. Neptune is beyond naked eye visiblilty, but it is just within range of good binoculars when seen from fully dark locations, preferably in the absence of moonlight. A good star map is required to find it. Medium to large telescopes show it as a tiny pale blue-grey disk. In 2010, Neptune completed its first orbit of the Sun since its discovery in 1846. 2019 SupCon: Mar 7, Opp: Sep 10 (Aqr). 2020 SupCon: Mar 8, Opp: Sep 11 (Aqr). 2021 SupCon: Mar 10, Opp: Sep 14 (Aqr). 2022 SupCon: Mar 13, Opp: Sep 16 (Aqr). 2023 SupCon: Mar 15, Opp: Sep 19 (Psc). 2024 SupCon: Mar 17, Opp: Sep 20 (Psc). 2025 SupCon: Mar 19, Opp: Sep 23 (Psc). "Direct your telescope to a point on the ecliptic in the constellation of Aquarius, in longitude 326 degrees, and you will find within a degree of that place a new planet, looking like a star of about the ninth magnitude and having a perceptible disk." Galle and D'Arrest discovered Neptune only days later. There followed a heated international debate over who should be given credit for the discovery, although Adams and Leverrier themselves took little part in it, and they later became friends. Today they are both credited with Neptune's discovery. Like Uranus, Neptune had also been unknowingly observed by other astronomers long before its actual discovery. Galileo, while he was busy observing Jupiter, apparently marked it down as a 'star' in his notebook in 1612 - some 233 years before its discovery! Joseph Lalande also recorded it in 1795, and James Challis - who in 1846 had been put in charge of the British search for Neptune - had also recorded the planet just six weeks before its discovery, but he failed to identify it at the time. Both astronomers had recorded it as an ordinary star. Pluto cannot be seen with the naked eye and is only visible in fully dark skies through medium or large-sized telescopes. A detailed star map, showing very faint stars, is required to locate it. Pluto reached perihelion (its closest point to the Sun) in 1989 - at which time it was actually closer to the Sun than Neptune. Shining at magnitude +13.7, Pluto was then brighter than at any other point in its orbit. Over the next century, it will appear slightly fainter at each successive opposition, until it reaches aphelion (its furthest point from the Sun) in 2113. 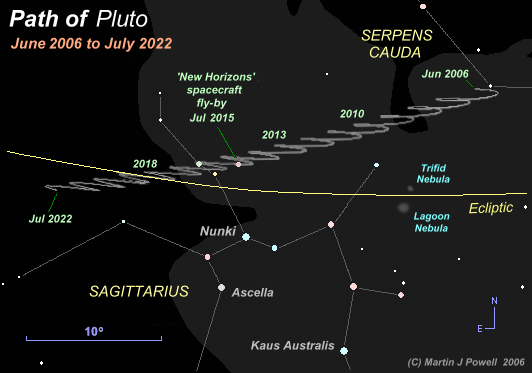 Pluto's opposition dates occur from mid to late July from 2019 through to 2025. A Northern hemisphere finder chart for the current year can be obtained at the BAA's Computing Section website. The diagram shows the view as seen from the Northern hemisphere - for the Southern hemisphere view, click here. Printer-friendly versions of the starmap are available for Northern and Southern hemisphere views. 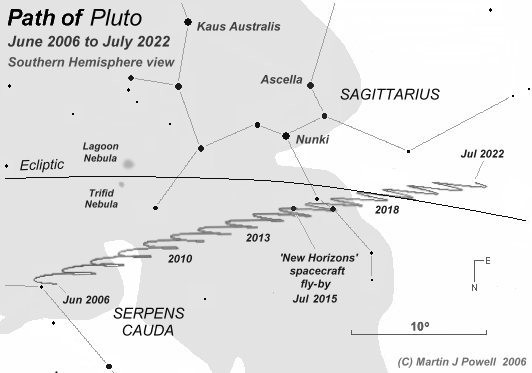 Star map showing the path of Pluto from June 2006 through to July 2022. 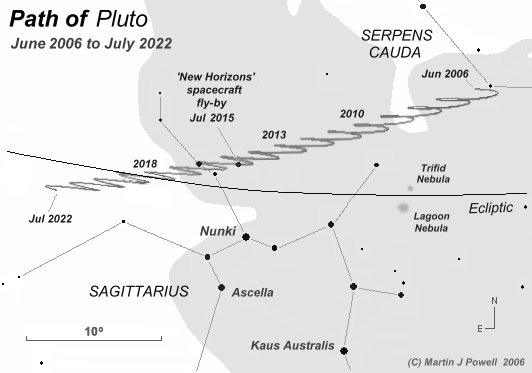 Pluto moved from the constellation Serpens Cauda - with a brief transition through Ophiuchus - into Sagittarius in late 2006, where it will remain until 2023. Pluto initially describes typical annual loop formations, which in this region of its orbit average about 2�.5 across (measured from eastern to western stationary points - for more details, see the Planet Movements page). The loops gradually open out into 'zigzag' formations as the planet approaches and then crosses the ecliptic (the apparent path of the Sun through the zodiac, indicated by the yellow line). The helical nature of Pluto's loop formations, resembling a stretched spring, is caused by its steep orbital inclination to the ecliptic (17�) coupled with the fact that it is currently on the descending half of its orbit. Pluto's opposition magnitude fades during the above 16-year period from +13.9 to +14.3. 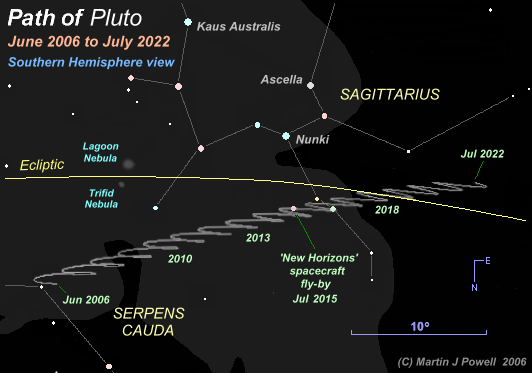 Also marked on the diagram is the position of Pluto when NASA's 'New Horizons' spacecraft encountered the planet in July 2015 (of which, see the Spacecraft Missions links below). Pluto was discovered in 1930 by the then amateur astronomer Clyde Tombaugh at Lowell Observatory in Arizona, USA , ending a 25-year-long search for what had become known as 'Planet X' - a sizeable planet beyond Neptune which was thought to be having a significant gravitational effect on the orbits of Uranus and Neptune. Having found the ninth planet, Tombaugh continued to search for other new planets for a further 13 years, but without success. In 1943 he reported that "it seems safe to conclude from the Lowell surveys that no unknown planet beyond Saturn exists that [is] brighter than magnitude 16� at the time of search." The name 'Pluto' was proposed soon after its discovery by 11-year-old British schoolgirl Venetia Burney, who had become aware of the scale of the Solar System during a recent nature walk with her school. Appropriately, the first two letters of Pluto matched the initials of astronomer Percival Lowell (see Mars history of discovery above) who had first suggested the existence of a planet beyond Neptune but did not live to see its discovery (see Reference 3 for the full story). However, Pluto turned out to be much smaller than astronomers had expected - so small, in fact, that it could not have had the gravitational effect on Uranus and Neptune that had been predicted, even though the calculations had - by sheer good luck - led them to find Pluto itself! Mainly due to its small size, Pluto's continuing status as a 'planet' has been the subject of much debate in recent years. Many astronomers had thought that Pluto should not be considered a planet, but rather one of the larger members of the Kuiper Belt - planetoids which orbit the Sun in the outer reaches of the Solar System beyond Neptune (so-called Trans-Neptunian Objects, or TNOs). The first Kuiper Belt Object (KBO) was discovered in 1992 and by the end of 2005, some 900 KBOs were known. These include (in approximate descending order of size): Eris, Makemake, Haumea, Sedna, Orcus, Quaoar (pronounced "KWAH-waa") and Varuna - which are all below magnitude +17.2. Evidently, there must be numerous larger-sized KBOs still awaiting discovery (see Reference 4). At a meeting of the IAU in the Czech Republic in August 2006, the issue of Pluto's planetary status was finally resolved. In accordance with the new qualifying requirements for a 'planet' (see Reference 5) astronomers decided that Pluto would no longer be classed as a true 'planet' because its highly-elliptical orbit overlaps with that of Neptune (in the words of the IAU Resolution, Pluto has not "cleared the neighbourhood around its orbit"). Pluto is now one of a new class of Solar System bodies called 'dwarf planets', whose other members are currently the asteroid Ceres (see above), Eris, Makemake and Haumea. Many astronomers disagree with the IAU's new definition, but in the meantime, the IAU is considering numerous other Solar System objects with a view to also awarding them 'dwarf planet' status. In June 2008 the IAU adopted the term 'plutoid' to describe Pluto-like objects orbiting at trans-Neptunian distances which have sufficient mass to form a near-spherical shape. As of 2008, only four objects were known to meet these criteria: namely Pluto, Eris, Makemake and Haumea (see Reference 6). The story behind Pluto's naming is told by Sean B. Palmer in his article Venetia Burney and Pluto (Return to Pluto Discovery History). Chad Trujillo (co-discoverer of Quaoar, Sedna, Eris and Haumea) has his own homepage, which includes discovery details, images of the Kuiper Belt Objects and the latest news on TNOs (Return to Pluto Discovery History). Details of the new definition of a planet (IAU 2006 Resolutions 5 and 6) can be seen at the International Astronomical Union website (Return to Pluto Discovery History). The IAU's full definition of a plutoid (press release IAU0804) is detailed here (Return to Pluto Discovery History). All of the spacecraft pictures used in this article are public domain. The Jupiter and Vesta spacecraft images are reproduced from the Solar Views and NASA's Dawn mission websites, respectively. The Mercury image is from NASA's Messenger mission website and the Pluto image is from NASA's New Horizons website. All other spacecraft images are reproduced from Bill Arnett's Nine 8Planets web site (where many more planetary pictures and information can be obtained). Historical and naming information were obtained from the books "Dictionary of Astronomical Names" by Adrian Room (Routledge, London and New York, 1988) and "The Guinness Book of Astronomy Facts and Feats" by Patrick Moore (Guinness Superlatives Ltd., Enfield, 1983). Other useful sources of information include "Norton's 2000.0" edited by Ian Ridpath (Longman Group UK Ltd., Harlow, 1989), "Astronomy: From the Earth to the Universe" by Jay M. Pasachoff (Saunders College Publishing, 1991), "Astronomy with Binoculars" by James Muirden (Faber & Faber Ltd, London, 1976), "Astronomy and the Imagination" by Norman Davidson (Routledge & Kegan Paul, London & New York, 1985), "The Search for Planet X" by Tony Simon (Scholastic Book Services, 1969), "First Steps in Astronomy" by P. F. Burns (Ginn and Company Ltd, London, ca. 1940), "Astronomy - The Definitive Guide" by Robert Burnham, Alan Dyer and Jeff Kanipe (Fog City Press, San Francisco, 2003) and "Universe - The Definitive Visual Guide" by Martin Rees (ed) (Dorling Kindersley Ltd., London, 2005). Opposition dates, greatest elongation dates and solar elongation values were obtained from the website Cielo e Terra ('Sky & Earth') by Piero Massimino (Astrophysical Observatory of Catania, Italy) and the book "The Observer's Sky Atlas" by Erich Karkoschka (Springer-Verlag, 1999). The commercial software 'MegaStar' (by Willmann-Bell, Inc) was used to determine the dates and forms of the planets' looping patterns and other positional details. The star charts were compiled using a variety of sources, including MegaStar and the freely-downloadable (and very useful) SFA Star Charts by Dan Bruton and SkyGazer Ephemeris by John Biondo. Star colours were based on those shown in "Patrick Moore's Colour Star Atlas" (Mitchell Beazley Publishers Ltd., London, 1973). To determine the general visibility times in the Planet Visibility table, transit times and solar elongations of the planets were obtained from the commercial software RedShift 5 by Maris Technologies Ltd. Details of the origins of the planets' astrological symbols (mouse-over the symbols to see the descriptions) were taken from the 'Astro Answers' column of the BBC's "Sky At Night" magazine (October 2007 edition, pg. 79). Images of the Roman and Greek gods and goddesses were obtained from the following sites: Crystalinks (Venus, Mars, Hermes, Saturnus, Neptune and Pluto), Linsdomain (Aphrodite and Zeus), Wikimedia Commons (Ares, Aeon-Uranus), Mercurius Relocations SAS (Mercurius), MSN Encarta/Erich Lessing (Cronus), Amazon.com (Jupiter, from where the statuette can also be purchased). Only two recordings are known to exist of Gustav Holst conducting his Planets Suite. The 1926 recording, performed by the London Symphony Orchestra, can be purchased from Amazon (US, UK, Canada) where samples can also be heard. In 2000, some sixty years after Gustav Holst's death, English composer Colin Matthews was commissioned by the Hall� Orchestra to write an orchestral piece for Pluto - then still classed as a 'planet' - which would effectively 'complete' Holst's famous work (Matthews had previously worked with Holst's daughter, Imogen). Matthews entitled his new composition Pluto, The Renewer, which is said to "emerge eerily from the disappearing final bars of 'Neptune'.."
In 1978, Jeff Wayne produced a musical version of H. G. Wells' novel 'The War of the Worlds'. Originally released as a concept album, it was adapted into a live stadium production in 2006. The opening scene of the musical, filmed live at London's Wembley Arena, can be seen on YouTube (Return to Mars Observational history). ask a question or report any broken links then please feel free to .